The vast majority of higher level politicians are very practiced when it comes to NOT touching their faces during conversations, negotiations, interviews and speeches. And yet the large bulk of these same politicians are not nearly as skilled as they believe. Today Senator Rand Paul (R-KY) announced his 2016 candidacy for Presidency of the United States. If you watched his speech (which by most accounts was a fairly good one), did you catch how many times he touched his face? .... or how many times YOU touched your face during your last conversation? Beginning at 17:07 Senator Paul continues, "... Without question we must defend ourselves and American interests from our enemies ... but until we NAME the enemy we can't win the war .... (long applause, then he rubs his left eyebrow with his left index finger [aka forefinger] at 17:25) ..... The enemy is radical Islam - you can't get around it ..."
When a unilateral eye or eyebrow rub is displayed - usually during or just prior to a statement, but sometimes afterwards - there is a very high likelihood that a lie is about to be told, is being said - or has just been spoken. 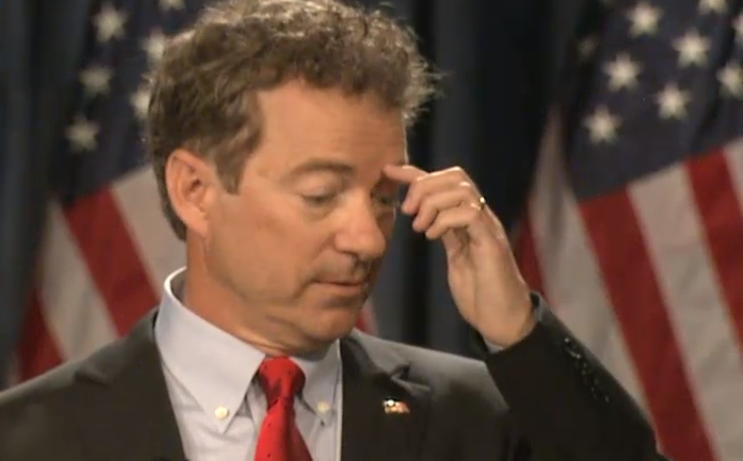 How many times does Rand Paul touch his face or neck during this particular speech? Perhaps Senator Paul believes those who belong to the groups he terms, "radical Islam" are indeed a threat - but this threat is greatly exaggerated. Or maybe he believes that those who he calls radical Islamic - are radical yes - but not truly Islamic (however he may believe that this will get him the numbers he needs for the republican nomination). Paul may believe that our greatest threat comes from Russia ... Or from within our own borders. It would helpful to ask him a series of questions in an interview style to flesh-out the details of these thought-emotions further - but you can be sure this Presidential candidate just told a fib. What other body language signal did Senator Paul show (and that's clustered with the eye rub) which indicates deception?